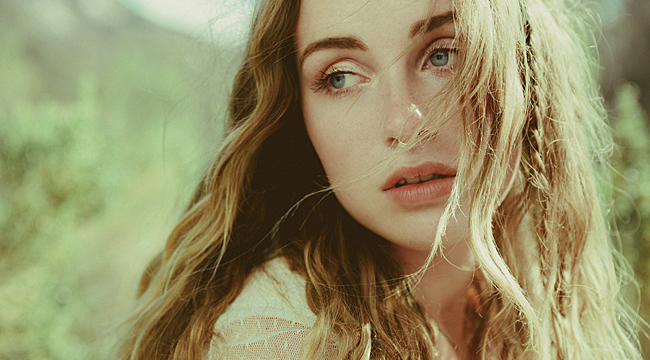 Born and raised in the tiny town of Pinetop, Arizona, pop singer Zella Day developed her raw talent from early age. She regularly performed at her grandmother’s coffee shop before she and her mother set off to L.A. in search of a record deal. Her major label debut, Kicker, came out earlier this year. Day recently phoned from Culver City, California, where she was “hanging out, having lunch and catching up, “with her manager before hitting the road for an extensive tour. You were born and raised in Pinetop. Talk about your upbringing and what drew you to singing and songwriting. Growing up in Pinetop, it was isolated, as you can imagine. There are only 7,000 people there and there’s no college so the town is very self-contained. There’s not a visceral art scene there. The scene for a young musician is non-existent. The only music scene that was going on during the time that I was living there was the one that surrounded my grandmother’s Mor Mor Coffee House. That’s when I was 9, 10 and 11. It was about three years. She passed away in ‘02. She was running it and it was the only place for live music. Every Friday was open mic and Saturday was live music. I just picked up a guitar when I was 9. It was the size of a ukulele. I still have it. It sounds great. It has nylon strings on it. I just started learning songs. I always sang. It wasn’t anything special. I was lucky enough to be in a place that had a support system for what I was drawn to, which was music. The guys that were playing John Denver and Bob Dylan covers taught me what they knew. That was my first stage. When I was 12, my mom drove me to Phoenix — we call that going down the hill — once a week for music lessons. I was talking lessons in theory when I was 12. I learned the circle of fifths. I started writing originals and by the time I was 14 I had about 9 originals and I made a record. Pinetop was the birthing place of my artistry. There was freedom to be exactly who I wanted to be and there was no competition to be had, which was really healthy for me at that time. I wasn’t comparing myself to anybody or anything. I just played music and it was very simple. You originally moved to Nashville to work on your music. What was that like? I got representation out of L.A. when I was 15 from the record I recorded independently. It’s called Powered by Love. My mom and I came out here when I was 15 and just through mutual friends had meetings set up. I met my manager that I still have now. We’ve been working together for five, going on six years. He sent me to Nashville. I wanted to be taken seriously as a musician. As we all know, there aren’t many 15-year-olds who are taken seriously in the music industry if they don’t have a television component. There were offers from Disney and Nickelodeon to do television and I declined those offers. I went to Nashville and my first meeting was with Dann Huff who has won producer of the decade and who recorded Rascal Flatts and LeAnn Rimes. He loved the music I was playing. He wanted me to connect with the writers. I was writing within the BMG publishing camp. I would stay there for a week and have writing sessions every day. I was 15, 16 at the time and going to the best music college in the country. Talk about the new album and when you started to write those songs. I have 200 songs written. I signed publishing before I signed a record deal. I was trying to write as much as I can. The songs for Kicker were written in the course of a year. Kicker was the Apache man who was working the 40-horse operation that we were developing. When I was six, I would go to the barn and would beg him to tell me all about all the magical things that made the Apache culture so amazing and beautiful. He indulged me. It was the first time I remember having vivid dreams and thinking outside the box for the first time. I was inspired by him and the Apache culture. Do the songs connect to that experience? Not necessarily. There’s two sides to the record. There’s a light side and a dark side. “Sweet Ophelia” was the first song that I wrote for Kicker. It’s a part of the light side when I was coming from Pinetop and moving to LA and everything was so innocent and untouched. I was new here in L.A. and everything was optimistic. I was writing and reflecting about my hometown and coming into myself in a new way since leaving and embarking on this new journey. The second half is darker and written when I fell into a toxic relationship. I started to see a different side of the city. I had to fight for myself in a way that I never had to before. It’s all part of my growth. The album title is just one word I used to categorize all of my experiences because it started in a simple place. I have learned through moving here and being part of this different world that I am Zella from Pinetop and I always will be. Wally Gagel and Xandy Barry helped produce it. Talk about their roles. I think of my two producers as my bandmates. It’s a solo project but it’s so nice to have people to collaborate with. That’s what they have provided. Xandy is a classically trained pianist. I don’t play piano so I have sat with him and written beautiful ballads like “Compass.” Wally is an amazing engineer. The three of us together created something special. I’m grateful for them and you can hear them on the record, which I think is cool. I needed some masterminds on the project. I know better than anybody that you can’t do things alone. I didn’t get to L.A. alone and I didn’t make this record alone. This is my story and it’s taken a village to get it out there.